Charles Christiansen Ed.D. OTR, Elizabeth Townsend Ph.D., "Introduction to Occupation: The Art of Science and Living (2nd Edition)"
The second edition of Introduction to Occupation: The Art and Science of Living, presents the latest knowledge about occupation so that each of us around the world may understand how to seize and harvest our days for health, well-being, happiness and the development of more just and peaceful societies. 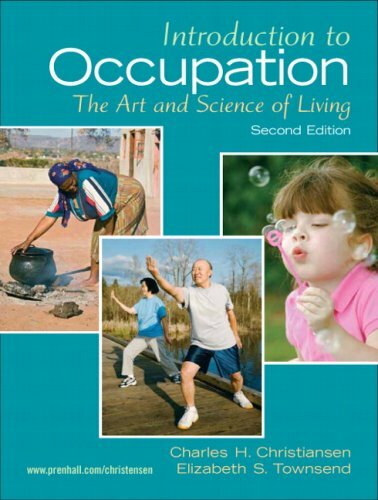 Introduction to Occupation will appeal to any student, practitioner, researcher or educator with an interest in everyday life. Practical as well as conceptual, this book challenges readers to look beyond occupation as just "work" to include all the ways in which we occupy ourselves-showing how what we do forms our lifestyle, and how occupations are enfolded to create a balanced or unbalanced style of life. Broad in perspective, it explores both informal and formal ways for studying occupation, provides a model and framework for studying occupational development across the lifespan, and considers issues and insights surrounding a variety of "occupational" topics.